MultAI Manager allows you to use your custom AIs in multiplayer games. It also allows you to switch between your AIs with the click of a button. 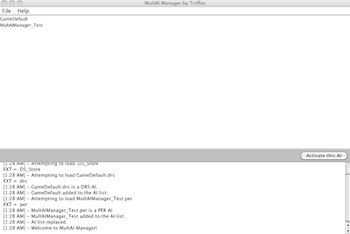 MultAI Manager was developed in 2010 by Tniffoc. 1. If you have not installed MultAI Manager, see the section on "INSTALLING"
2. Before you go any further, you need to copy your gamedata_x1.drs file from %AoE Folder%/Data to wherever you keep you AIs. You should rename it to "DefaultAI.drs". 3. It is now time to run MultAI Manager. If you haven't already figured it out, please look at the section called "RUNNING". 4. Once you have MultAIManager up and running, you need to tell it two things. 1. Where to find your AIs, and 2. Where to put them. 5. Click on File-Choose AI Directory and choose the directory where you keep you AIs (and you copied "DefaultAI.drs" to). 6. Click on File->Choose Data Directory and choose the directory inside of your Age of Empires install folder where gamedata_x1.drs is. This will be the "%AoE Folder%/Data" directory. 8. Now, all you have to do is select the name of the AI you want to activate, and click "Activate AI". 9. Please note that the name of your AI will never actually show up anywhere in the game. Trust me, its there. You can make it talk and it WILL talk to you. 10. Please refere to the NOTES and WARNINGS sections for some VERY IMPORTANT notes. 2. Congratulations! You've installed MultAI Manager! You should also be able to just double-click on MultAIManager.jar, though this system seems to be flakey when using different versions of Java (JRE). MultAI Manager edits the Age of Empires II game data files may cause harm to your game if used improperly. Tniffoc provides no guarantee about this software. You should always make backups of your gamedata_x1.drs file BEFORE starting MultAIManager. What's wityh the super wide post? Anyway sounds really cool. A whole new programme. Something you don't often see nowadays. I don't know why when I chick "Activate this AI" ,it says "couldn't delete the current gamedate_x1.drs!" This is happening because the program can't find your original "gamedata_x1.drs" file. When you selected your Data Directory did you select the directory called "Data" inside of your Age of Empires folder? EDIT: fixed the first post. I've tested this tool, but there's a error occured. And another question is can this tool support multi-per files? With java's handy API, i think it's possible to realize the function. That means that the program didn't have the right permissions on the gamedata_x1.drs file. Try running the program as an administrator. I encountered the problem "couldn't delete the current gamedate_x1.drs!" aswell even with administrator rights. The reason is a small bug in MultAI_Manager which does not close after reading it. Add a the following line to AIListView.java after line #155 and compile again. Just made the update. Uploading new file now. Line 2: ERR3001: Invalid preprocessor directive: ned"
It cannot support multiple PER AIs and there is no plan to at this point. The way the injection technique works makes it really hard to implement. Sorry for the problems but I hope the tool is still useful without the multiple PER file support.